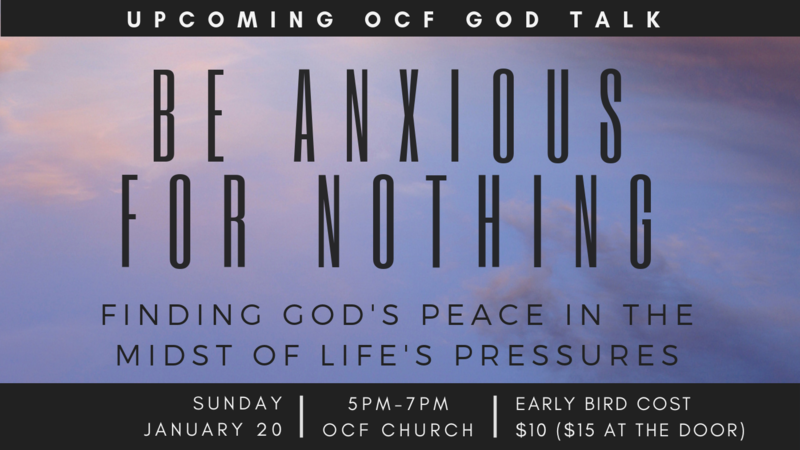 We invite you and anyone you think would benefit to join us on Sunday, January 20th for our OCF God Talk, BE ANXIOUS FOR NOTHING: Finding God’s Peace in the Midst of Life’s Pressures. This much needed presentation will address the epidemic of mental health issues in our culture. It is likely that everyone in our church has either suffered personally from the effects of mental health related issues or knows someone who has. We would love to do our part to help all those who struggle in this area and we have fashioned our God talk with that purpose in mind. We are blessed to have three experts in the field of mental health joining us: Kevin Van Lant (PhD), Laura Niebaum (MFT), and Lauren Richardson (PhD). During our panel discussion we will evaluate the scope of mental health issues in culture and begin to shape a way forward for those seeking to overcome the obstacles it presents. Following our panel discussion, we will have a question and answer session and we will also provide a packet of resources that will offer guidance for those struggling as well as those who are helping along the journey. Childcare will be available at this event for children in 5th grade and younger. Childcare cost is $5 per child. Kevin Van Lant is a licensed clinical psychologist who received his Ph.D. from Rosemead School of Psychology, Biola University. He teaches courses in pastoral care and counseling, marriage counseling, psychopathology and health psychology. Van Lant has a clinical practice at the Center for Individual and Family Therapy (CIFT), a large, non-profit Christian counseling center in Orange County. He also serves on the board of directors for CIFT. In his clinical role, he works primarily with depression, anxiety and stress disorders as well as couples and those suffering from long-term emotional and spiritual distress. Van Lant speaks on a broad range of topics including men’s issues, parenting, marriage and general relationships issues. Laura’s passion and experience with individuals, adolescents, young adults and families, help provide a warm, comfortable and safe environment to work toward growth and healing. Her BS in Education from USC, MS in Marriage and Family and MA in Theology from Fuller Theological Seminary enable her to come alongside people facing issues in adolescence, young adulthood, spiritual issues, parent/child problems, premarital counseling, family problems, anxiety, depression and difficult life transitions or circumstances. As a former youth pastor/educator, Laura typically works with adolescents and young adults, but her practice is not limited to these types of needs. She also sees all ages of people who face difficulties with anxiety, depression, life transitions, grief or need a safe place to process difficult emotions. Laura is also currently an adjunct professor at Azusa Pacific University. She is deeply passionate about education and care for the local community. Though she loves seeing clients, she also spends time doing trainings and education in the local community. Dr. Richardson is a licensed psychologist who is passionate about engaging in a collaborative process of exploration and healing with people who are encountering painful life circumstances and are in a place of feeling stuck. She desires to assist people in discovering their unique path of healing that reflects their individual identity and life experiences. For each person with whom she works, her hope is to come alongside the individual, create a space of acceptance and identify the root issues that are preventing the person from living a meaningful life. Ultimately, Dr. Richardson’s goal is to provide guidance toward a place of peace and balance. Dr. Richardson provides therapy for individuals with a wide variety of challenges including trauma, alcohol and substance addiction issues, grief and loss, relationship issues, and self-esteem and identity issues. She is especially skilled at assisting people with complex and severe mental health issues. Additionally, she is passionate about helping individuals work through and cope with medical health issues. Dr. Richardson also has interest in spiritual and religious issues and is open to incorporating one’s spirituality into the therapeutic process. Dr. Richardson also provides psychological assessment to both children and adults.